What Is the Coveo Platform? As an end-user, what you see of the Coveo Platform are the Coveo .NET Front-End search interfaces (see About .NET Search Hubs and Search Interfaces) available from the various Coveo access points (see Coveo Access Points). This topic describes the hierarchy of Coveo Platform components to help you understand how hubs, search interfaces, the unified index, collections, sources, repositories, and documents are interconnected. Behind the scene, your Coveo administrator configured the Coveo Platform to build a unified index from the content of a number of repositories within your organization. On the Coveo server, your Coveo administrator created index subdivisions by defining one or more collections, containing one or more sources. Each source points to a set of documents to be indexed from a given repository. Repositories are existing systems (such as file share, email server, email archive, web server, intranet, database, CMS, CRM, ECM, PLM, and Wiki) within your organization. Your Coveo administrator may also define groups of Coveo users, referred to as audiences (for example: Everybody, HR, Sales, Engineering…), and assign one or more audiences to each search hub, so that each audience has access to appropriate search facilities. A search hub contains one or more .NET search interfaces. Each .NET search interface has a specific scope as it connects to one or more collections. The following figure illustrates an example of how your Coveo administrator can organize the various Coveo components using some of the standard .NET search interfaces. Tip: Using the Desktop Integration Package (see Desktop Integration Package) you can add the content of your computer to the unified index (see Specifying the Personal Folders to Index and Configuring Local and Archived Emails to Index). The following table provides definitions for various Coveo concepts. Audience Coherent group of Coveo end-users defined by the Coveo administrator to be associated with a search hub to control the access to the search hub. Example: The Sales audience contains all the people from the sales department. Search hub A Coveo user interface access point, accessible to one or more audiences, offering one or more .NET search interfaces. Example: The Sales search hub provides access to the People and Customer Relationship Management (CRM) .NET search interfaces. Search interface A user interface providing access to parts or to the whole unified index content. A .NET search interface contains a search box and presents rich results together with facets that you can use to refine your search (see About .NET Search Hubs and Search Interfaces). Example: The Intranet .NET search interface provides access to the content of the Intranet. Scope For a given .NET search interface, the set of collections in which a query searches. A scope may also include hidden filters to further restrict the results to specific criteria. 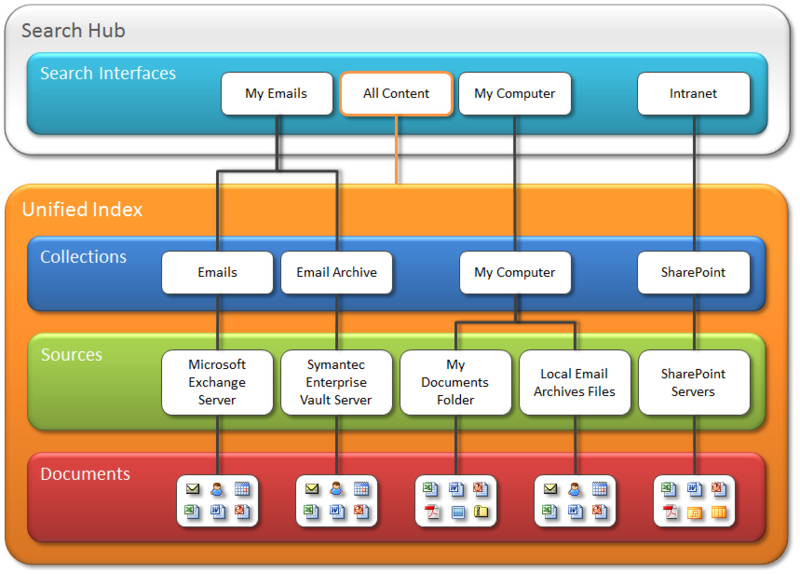 Example: The scope of the My Email .NET search interface uses fields to restrict search results to the user email mailboxes and contact content from the Microsoft Exchange and Symantec Enterprise Vault collections. Repository A system containing documents. Examples: The hard disk of your computer, a network file system, a SharePoint Intranet, a Microsoft Exchange server, a Web content management system (WCMS) such as Sitecore. Unified index The heart of the Coveo Platform, containing references to the full content of all documents, from all indexed repositories. Collection Index subdivision consisting of a group of sources assembled around a theme, having its own security permissions. Example: All sources related to the human resources department. Source Index subdivision consisting of a coherent group of documents from a single repository, having its own security permissions. Example: All files under the Engineering folder in a network file system.